Peace Corps Online: Roll Of Thunder, Hear My Cry by Mildred Taylor. Mildred worked in Ethiopia for two years with the Peace Corps. Roll Of Thunder, Hear My Cry by Mildred Taylor. Mildred worked in Ethiopia for two years with the Peace Corps. Peace Corps Online: Directory: Ethiopia: Peace Corps Ethiopia : Web Links for Ethiopia RPCVs: Roll Of Thunder, Hear My Cry by Mildred Taylor. Mildred worked in Ethiopia for two years with the Peace Corps. Roll of Thunder, Hear My Cry is a novel of realistic fiction that concerns itself with issues of prejudice, courage, and self-respect. The story occurs in a small town in Mississippi in 1933, during the height of the Depression. The author allows the reader to experience the racial issues of the time through the eyes of an initially naive Cassie Logan. The racial tension and types of events experienced by young Cassie, her family, and town members cause her to grown up and discover the reality of her environment. This is a powerful book that should be read by all people. Mildred Taylor vividly portrays the racial and economic climate during this period in American history. 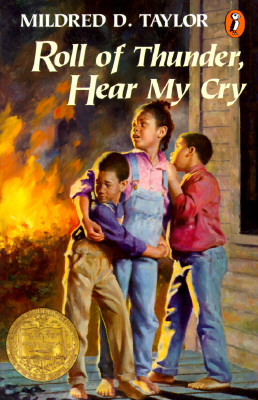 Roll of Thunder, Hear My Cry can easily be used in conjunction with social studies lessons on the Great Depression , segregation, the sharecropping system, slavery, and Reconstruction. It should be used in units based on family values, prejudice, courage, self-respect, growing up. The possibilities for this superb novel are only limited by the imagination of the educator. Mildred D. Taylor was born in Jackson, Mississippi at a time when African American people in America were still struggling for full freedom. When she was three months old, her parents moved with Mildred and her sister to Toledo, Ohio, where she spent most of her childhood. When she was going to school in the 1940's and 1950's, Mildred disliked the way African American history was taught. She believed that it did not tell the way things really were. What she heard in school did not sound anything like the history she learned from her father and her grandfather. Mildred's father was a master storyteller. The Taylor family often sat spellbound in front of the fireplace or the front porch under the moonlight listening to the stories of African American people who lived their lives with pride and dignity.These were stories of real people who had lived in Ohio and Mississippi. Some of the stories had been passed down through generations, from the time of slavery. Mildred became inspired by the heroes of these stories. Their example taught her to love and respect herself, her family, and her heritage. After graduating from the University of Toledo, Mildred worked in Ethiopia for two years with the Peace Corps. She spent two years teaching English and history in Ethiopia. Her stay there taught her more about what life was like for African American people before they were brought to America as slaves. The pride and independence of the people she observed reminded her of stories her father told her. Mildred returned to the United States to teach and recruit for the Peace Corps. She then studied journalism at the University of Colorado, where she received her Master's degree. While attending the university, she joined the Black Student Alliance (BSA) and helped to create a black studies program at the school. After graduating, she worked as a study skills coordinator. Her father's stories had become such a part of her that Mildred wanted to put them down on paper. Her first attempt was a story called "The Friendship" which she did not publish for many years. She did not feel that on paper it had the power it had when she heard it told by her father. She decided not to publish it until it was strong enough to give the reader the same kind of response she felt when she heard the story as a little girl. She wanted to be sure that the reader would feel sadness and outrage at the unjust treatment the character Mr. Tom Bee had received just because of the color of his skin, and feel admiration for his courage and dignity in the face of discrimination. When The Friendship was ready to do all that, it was published. Mildred Taylor had received critical acclaim for her original interpretation of the African American experience. Her first book about the Logan family, Song of the Trees, won the Council on Interracial Books Award in the African American category. It was also a New York Times Outstanding Book of the Year in 1975. MsTaylor. won the coveted Newbery Award in 1977 for Roll ofThunder, Hear My Cry. In 1997, she was the recipient of the ALAN Award. Mildred D. Taylor's deceased father would be very proud of his daughter. Like him, she has become a Master Storyteller. Roll Of Thunder, Hear My Cry: A Literature Unit- Order this unit on line. National Civil Rights Museum - Take a virtual tour! I need to know how to write a research paper on Roll of Thunder, Hear My Cry. I am looking for a publicity photo or any portrait-type picture of Mildred Taylor to use on the cover of a biography I am working on. This will be part of a series of books called The Library of Author Biographies that will be sold to middle school libraries. I am just looking for more information on Mildred D. Taylor to finish my term paper if anybody could help I would be very grateful. Thanks. I am looking for lesson plans or activities that go with the novel The Well. Things like comprehension questions, vocabulary, parts of the plot, literary devices, etc. help. I am looking for information/activities to specifically connect the Great Depression to "Roll of Thunder, Heare Me Cry". I have lots of info. for racism and African American Civil Rights. Thanks for your help. I am a student and looking for help with explaining the development of Cassie's character throughout 'Roll of Thunder, Hear My Cry'. If anyone can help quickly, before tomorrow i will be sooo grateful! Where can we get the pictures? I am a student at a Georgia Middle School and just recently I finished the book Roll of Thunder, Hear My Cry " it was really a touching book and I also got very upset but,thumbs up to Mildred Taylor! Good Job. i just read Roll of Thunder, Hear My Cry and I almost cried! 5 stars!!!!!!!!!!!!!!!! this article was very helpful and added a lot to my literary analysis. I just read this book in my class. I'm doing this book 4 a school project and I need a picture of Cassie Logan. i love this book but i need pics and a copy i can use online because i hate books i loose them like crazy!!!!!!!!!!!! WHY DID MILDRED D TAYLOR NAME HER BOOK ROLL OF THUNDER HEAR MY CRY ? The book is NoT stupid it is about a girl trying to grow up in Mississippi when black people had no rights!!!!!!!! OMG i loved this book and whoever says its stupid is stupid themselves because they don't understand it! especially T.J he is so cute!